A couple weeks ago I agreed to something really dumb. I can’t tell you what it is unfortunately because of a privacy contract, but I can tell you it meant a lot more work for me without benefiting my happy blog place. During the process of this extra work I slipped on a patch of ice and bounced my skull off a sidewalk, giving myself a concussion. Murphy’s law of course! So over Christmas break I’ve been trying to squeeze in extra work on top of dealing with a head injury. I’m mainly back now though, and done enough that I can relax some and resume my favorite obsessive activity. I do admit it was nice for a couple weeks to just cook by instinct. No measuring, no photographs, and no writing. I felt peaceful, happy, and free of stress even feeling as yucky as I do. This made me realize I like cooking much more than I enjoy photography. When I was younger I thought that would never be the case. Or maybe that’s just the head trauma speaking. This pie is one of my favorites. It’s my “I’m sorry I was absent” gift to you. I hope you like it as much as I do. I still need to rest much of the time, but am looking forward to heading over and seeing what you all have been cooking as soon as I stop sleeping all the time. I am a terrible patient, but a very good impatient. I'm sure I'll be up to my ornery self again in no time. 1. Place the oven rack in the lower third of the oven and preheat to 400 degrees. Set out a 9 inch Pyrex pie plate. 2. Strain the juice from the plums into a large saucepan. Cut the plums in half, then half again pitting as you go. Set plums aside. 3. Mix together the sugar, flour and salt in a bowl. Do not skip this step or you’ll have flour lumps. Pour the mixtures into the saucepan with the plum juice. Cook the mixture over medium heat stirring often and first, and constantly as the mixture heats. Cook and stir scraping the bottom of the pan with a wooden spoons until the mixture is very thick and gooey. 4. Turn off the heat from under the sauce pan. Add the almond extract and sliced plums and stir to combine. Set aside. 5. Gently Roll out the pie crusts between sheets of wax paper. Stretch the dough an inch or more if you can for the bottom layer. Place the dough into the pie dish and brush lightly with egg white. 6. Next, pour the hot filling into the pie dish arranging the plums around if needed. *Don't overfill the pie. Leave out a little of the juice if it gets too full. * Dot with butter and top with the top crust. Flute and cut vents into the dough. 7. Place a pie shield over the crust and bake pie for 30 minutes. Then remove the pie shield and bake for about 10 more minutes, or until golden brown and done on the bottom. 8. Remove from the oven and cool on a cooling rack for several hours or overnight. Oh dear, I'm so sorry you had that accident but I'm glad you're on the mend. I was wondering why we hadn't heard from you, but you came back with a winner. Sounds like something I do, eek! Glad you are doing good, obviously the pie is fantastic. We ate a lot of plum everything growing up since my mom loved it! That's a beautiful photo and I am sure the pie is great.but more importantly..GREAT that you are recovering.Don't try and do too much too soon..
Are you feeling 100%?Hope so! Happy New Year and how is your mom? Laura, you poor thing! Glad to know that you are getting better. This looks like a great pie! oooh you poor thing :(. what a way to spend the holidays. At least you got to cook haha. 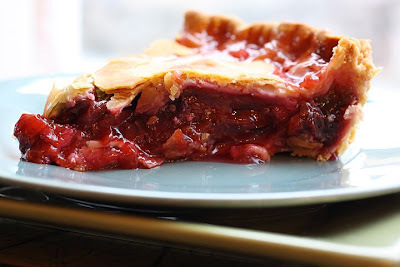 I've never had the pleasure of eating plum pie. It looks so good. Oh my, that is just terrible. If you were any closer then I would make you a big batch of hot tea and feed you until you relented. That is just what us Texans do. I'm struggling greatly with the photography but excelling at the food part of my future Food Styling career. I made the most delicious pot of cajun red beans & rice for the New Year and it photographed like (blah). What IS the secret? I remain forever in your debt! Oh my gosh! I'm SO sorry to hear about your head injury, but I'm glad you're getting better!!! I wondered where you were...you've been missed! Now, take it easy and get well! BTW, your pie looks so good! Oh my goodness!! So sorry to hear about your accident, but glad to hear you are feeling a bit better. The pie sounds great. Hope your recovery is well!! Oh no! Was missing seeing your posts and didn't realise you were injured. Hope you manage to get lots of rest and are back to your usual self soon. So amazed you managed to make this awesome looking pie even while recovering. So sorry to hear about your accident - I hope everything is okay now. How weird how our passions change sometimes don't you think? I feel opposite - now I am more interested in photography than cooking! I wondered where the heck you were! I hope that it is the head trauma speaking considering I LOVE YOUR PHOTOS that go with YOUR AWESOME RECIPES! I hope that you are feeling better and have a wonderful 2010! Plum pie YUMMY. Oh my, what a perfect pie, Laura!!! Sounds delicious! So sorry to hear about your accident. Take it easy, please, with a head injury. I know from experience. Sending you a virtual pot of vegetable soup. OMG! I so hope you are ok. You poor thing! This pie looks delicious, absolutely wonderful. Ill take mine with vanilla ice cream on top. Holy crap that pie looks good!! The crust is ..so..flaky! :) I think I want to eat my screen. & I'm sorry to hear abt your accident. I hope you feel better soon!!! Try to photograph them in a brightly colored bowl almost heaping to the top. Maybe red, purple or blue would work. Bean like dishes are so hard to photograph, probably the more difficult really. I am not a food stylist, so that sort of thing is difficult for me too. Ahhh what I would give to have a food stylist sibling!! I hope you're back to 100% soon. I miss you, but that's half my fault b/c I haven't been online much either. And if you say this is a favorite pie, then you know I have to try it. You make the best pie (and cookies) ever! Which reminds me, I made your dulce de leche apple pie again b/c it was requested at a dinner party on Saturday. Everyone was rolling their eyes and groaning in bliss--they loved it! I drizzled the top with dulce de leche this time, which made it impressive looking too. Laura, I'm so sorry about your accident. Rest and get better soon sweet one. Aren't you a trooper to give us this great recipe in spite of it! It looks soo good. I hope you are feeling 100% asap. I love the cooking and the photography aspects of food, maybe the styling and photography a bit more than the food! Your pie looks absolutely delicious and I hope your feeling better soon!!! Laura, I'm glad you're feeling better enough to tell us how you're doing! That pie looks fantastic. I made your dulce de leche pie again the other day. If I get any good photos of it, I'll write about it. I'm so sorry to hear about your accident, but glad you're getting better! This pie looks fantastic!!! I love plums. I never thought of plums in a can, I'm not sure if I've seen them in a can before... I'm going to have to look for that. I automatically assumed fresh plums. I will have to try this recipe out some time when I get a chance. Oh my... don't know how I managed to miss this post. I'm so sorry to hear about your little accident, but I'm so glad you are feeling better now. Interesting Cinn/toffee cookie recipe! Oh man I hate to hear that! Concussions are no fun, that is for sure. I'm glad you are okay! I made this pie for Den's family's Mother's Day picnic at his cousin's house. It's an annual thing that his whole extended family comes to. Practically every person there complimented me on the pie and the only ones who didn't were those unfortunate enough not to have nabbed a piece before the pie disappeared. Thankfully I wasn't one of those unfortunates. I grudgingly shared it with Dennis and it was fabulous. Thanks for sharing this simple, yummy recipe! I made this pie today after months of thinking of Little Jack Horner's pie. I don't have a food processor, so my 18-month-old son and I used out hands to make the pie crust. He kept eating the dough as I was working on rolling it out. We had a lovely time thanks to your kind sharing of your culinary skills. By the way, it tastes like a royal British pie. I felt I was enjoying pie at theQueen's palace! Thank you!